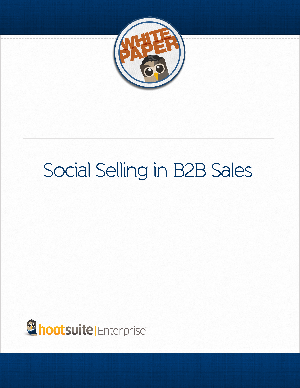 Today's B2B buyers are socially sophisticated and informed. Do you have the tactics, tools and training to leverage social media for sales success? Find out how to use social media to relate to customers, identify opportunities for engagement, establish credibility, and stay visible and valuable at every state of the purchase process. Build your funnel with real-world tips on using social to listen, learn and engage. Crush your targets with insight on how to use social channels to collaborate—and close deals. The current state of social selling in B2B sales, and the crucial areas where you can gain strategic advantage over the competition. How to deploye the right combination of people, platform and process to turn your sales organization into a social powerhouse. How HootSuite helps organizations master social media to meet their sales goals.